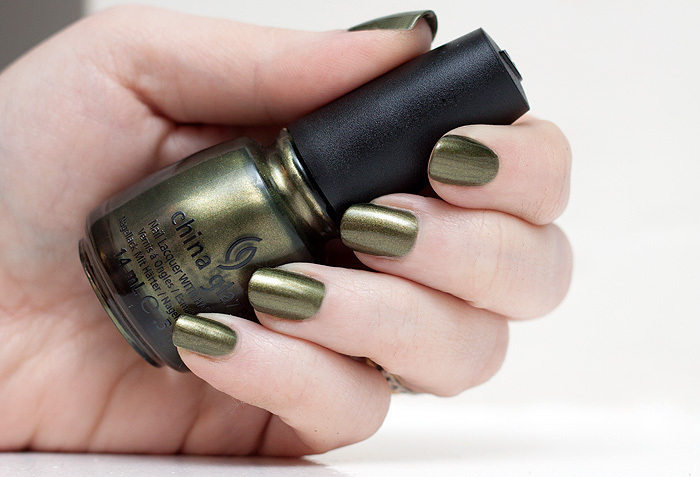 The soon-to-be released Hunger Games collection from China Glaze has been setting the nail polish blogs alight with swatches and banter about the names and how they relate to the book and upcoming film. I’ve got two shades to show you today; Agro – a metallic olive shot through with a heap of gold flecks and Dress Me Up – a dusty rose creme. Agro* is a beautiful shade, not hugely unique but the formula is beautifully done. If I’d been a little bit more careful in application, this could have squeezed through as a single-coater but the photo above demonstrates two coats to cover a couple of thin patches. There’s not too many golden greens that look good against my cool skintone but thankfully this one doesn’t give me any issues at all. Dress Me Up* is a simple dusty rose creme, I’m not a huge fan of these shades though I know many are. Personally, I’d rename it Dress Me Up… Grandma. The formula on this one is a little off – thick but runny, almost like it’s overcompensating for being on the thick side. Again, this is a two-coater and the coverage is incidentally, pretty great. There are a total of 12 colours in the collection, I’ve already placed my order for Fast Track and Harvest Moon as my next permanent additions to my beloved Helmer. China Glaze is available to buy at Sallys or Beauty4Nails-Body (which has to be the worst name for a shop, ever). Are you tempted by any of the shades in the new Hunger Games collection? I’m tempted by so many of them but Agro is THE must-have! I also want Riveting, because anything with golden shimmer says my name! Once or twice and then just forgetting about them! Agro is just a stunning green colour, it might be the perfect green I’ve been looking for. Oooooh, I hatehatehate the names, they’re crap. Agro looks really nice on you! Electrify looks like a really fun glitter as well, I quite fancy that one. None of them are really doing it for me, if I was FORCED to pick two I’d probably go Luxe and Lush and Smoke and Ashes – but that’s at a real push. Was hoping for a lot more from this collection! Luxe and Lush, Smoke and Ashes and Hook and Line!! Hmmm, I’m not in love with these two colours, but I do really want some of the other colours in the collection. I’ve been having trouble figuring out whether they’re actually going to be sold in the UK though – where have you placed your order for them? I really like Agro, and I want Smoke and Ashes so much ! Look what I bought last week! 25% off at HQ Hair!